All transactions are safe and secure with a reliable history in online purchasing behind each of our associates. Buy the Star Trek Phasers and Communicators to own Star Trek clothing and merchandise. The perfect Star Wars costume accessories that can also be used as toys and collector's items, these Phasers and Star Trek Communicators bring to life the fictional instruments by giving you detailed props through which you can live out your deep space fantasies. 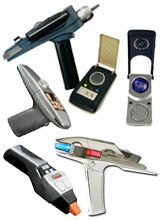 Due battle with Star Trek Phaser replicas that simulate versions seen in the original series, The Next Generation, The Wrath of Khan and more. Pair them with Communicator replicas, which are the equivalent of highly advanced cell phones that don't require sattelites to function. In addition to the Star Trek Phasers and Communicators above, browse the Star Trek Clothing Gallery for more apparel like men's and women's clothes, kids shirts or hoodies.